3.5x4 Customized Indoor Magnets 55 Mil Round Corners are a fantastic way to display your business information to customers daily. As these printable magnets can be stuck against refrigerator doors, metal shelves and any metal surface at home, they will always come face to face with your customer or client, thus building a stronger bond with your brand. The 55 Mil thickens makes these custom square and rectangle magnets strong and durable. Place your order for these magnets Made In United States now to get free shipping in the Contiguous USA, no setup fee and full color professing facilities. 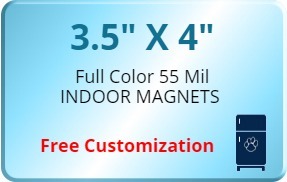 Request a quote to know what you can save on ordering 3.5x4 Customized Indoor Magnets 55 Mil Round Corners.